Andrew Ardington, in partnership with legendary Anglo-Zulu war historian David Rattray, created Three Tree Hill Lodge to evoke the drama and tragedy of the Anglo-Boer war. The current lodge owners continue with this vision. 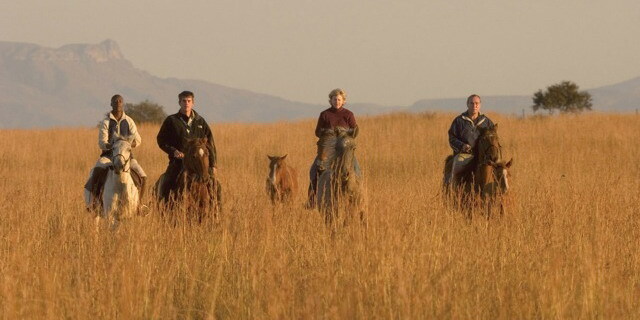 Set on Three Tree Hill, the lodge offers panoramic views of the Spioenkop Battlefield, as well as Spioenkop Nature Reserve, home to white rhino, giraffe, zebra, and a host of smaller mammals and birds. The Idyllic setting belies the tragic events that were to unfold on January 24 1900, when Boer and Brit fought over Spioenkop in the bloodiest battle of the Anglo-Boer war. With the majestic Drakensberg as backdrop, guests are introduced to the origins and causes of the Anglo-Boer war. 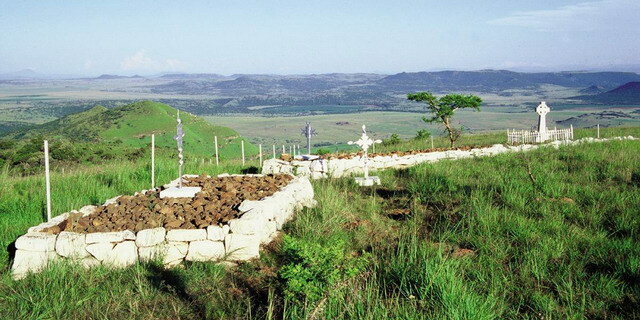 On the following day, you will be taken on a tour of the Spioenkop battlefield itself, where your guide brings to life the tragic events of January 24. With historic figures like Winston Churchill, Louis Botha, and Mohandas Gandhi all featuring in the battle, the story of Spioenkop is a fascinating and moving tale. In keeping with the historic atmosphere, Three Tree Hill Lodge has been constructed using wood and iron so as to resemble the housing kits brought out from Britain in the nineteenth century. The lodge is stylish and extremely comfortable, with no luxury spared. The six spacious cottages each have full en-suite facilities, with shower as well as bathtub, and a veranda. They have been positioned so as to give guests magnificent views across Spioenkop, from every angle. Three delicious meals, as well as teas, are served daily. The lodge makes the most of it's beautiful location and, weather permitting, meals are taken on the wide verandas in front of the main lodge. Guests are also invited to enjoy evening sundowners around a cozy campfire. A viewing deck, swimming pool, walking trails, and library complete the unique Three Tree Hill Lodge experience. Like it's sister property, Fugitive's Drift Lodge, Three Tree Hill Lodge is about much more than just a battle. The story of Spioenkop is a very important component of South Africa's explosive history, and even has broader geo-political implications in early twentieth century world history. Most importantly, however, it is yet another example of the clashing of cultures that has marked South Africa's past, and continues to be a very important component of the challenge facing the country. 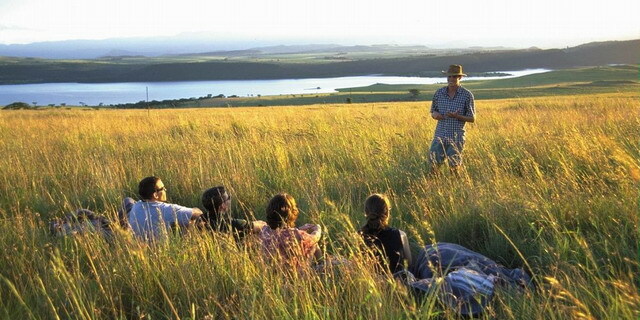 Three Tree Hill Lodge was the first hotel in Kwazulu Natal to be awarded a Green Leaf Environmental Standard. This international standard assesses the impact of hotels on their environment in order to encourage sustainable, eco-friendly development. From solar panels to creative recycling, Three Tree offers an exemplary standard of positive environmental impact. Three Tree Hill Lodge is a Luxury Guest House Located in South Africa's Drakensberg Mountains.